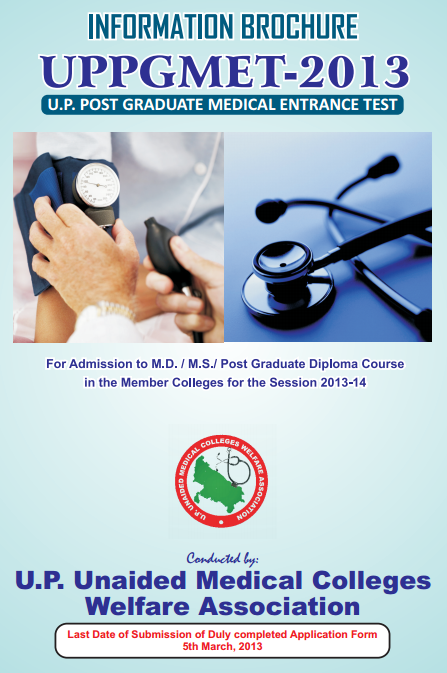 UPPGMET 2013 for UP Unaided Medical Colleges Welfare Association - AcrossPG Exams! Writ Petition No. 4265(MB) 2006 and writ petition No. 276(MB)2007.
on the basis of marks secured in the above UPPGMET-2013. 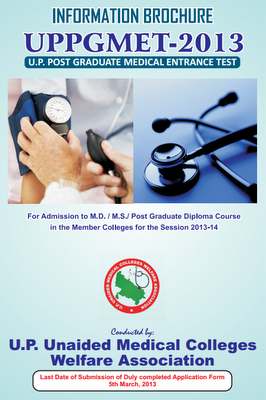 lmember medical colleges of Uttar Pradesh. lguideline of syllabus given in the appendix of this brochure. lThe UPPGMET-2013 will consists of a maximum of 250 marks. lThere will be negative marks of 1/4 for each wrong answer. perdirection even in the OMR Sheet. lstrictly prohibited during the examination. ltill the completion of the examination. lexamination & fill up all the relevant information. For this no extra time will be given. * Approved unaided medical colleges of U.P. State offering MD/MS/Post Graduate Diploma courses as on September 30, 2012. ** Proposed to start Post Graduate Courses from academic session 2013-14.